Hagerstown Canteen Service vending machines are new, stylish and offer a number of payment options. 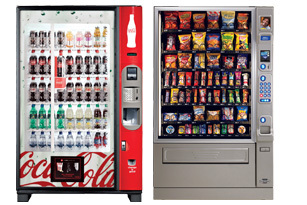 We install, fill and maintain every machine at no cost to you. Keep your employees on the job with the food and beverages they need right in your office. If you have a large employee pool, we can even install your very own convenience store with one of our customized Micro Markets. Everything is guaranteed to be fully stocked to keep coffee flowing and employees going. No need to make a coffee run, great coffee is right in your break room, 24/7. Hagerstown Canteen Service also installs water purification systems. We change ordinary tap water into premium drinking water with a plumbed in unit in your Myersville business. Getting started is simple. Just call us at (301) 223-8000 or send an email to info@hagerstowncanteen.com. Our account managers are standing by.